Crafting this dress was a bit of an experiment. I had never made something like this, but I thought the shape of a fairy dress was a bit different than a typical tutu dress, so I knew I had to give it a go! 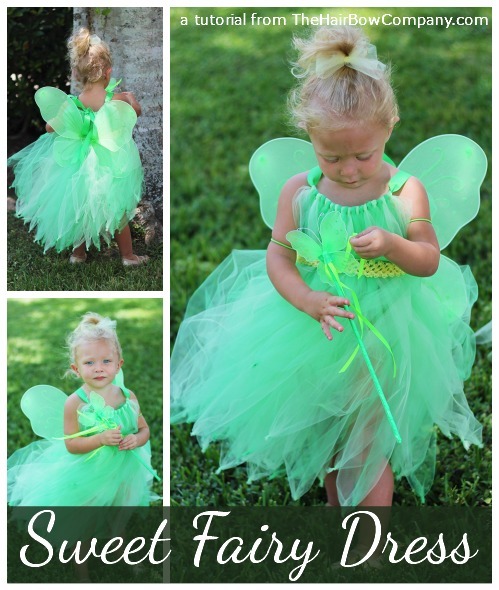 I basically created this dress the same way you'd craft a ribbon tie tutu. (Tutorial here.) However in this case, the ribbon will go around the top of your daughter (like a shirt collar), rather than her waist. 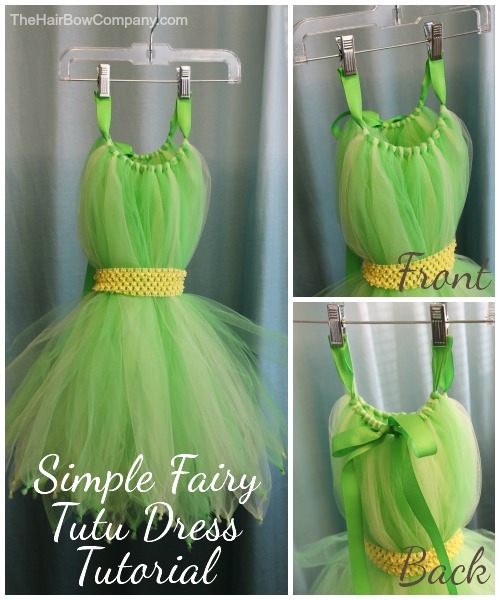 Measure the front of your daughter to see how much tulle you'll need across the front of the dress. I made this dress for a two year old and the front was about 6.5" across. I knotted 48" inch strips of tulle (folded in half so the dress is 24" long) along the ribbon. (My ribbon was about five feet long.) Once I had 6.5 inches of tulle attached, I left about 7-9 inches empty on either side of the tulle. Then I attached about 3.25" to each side to create the back. When you're done making it, it doesn't look like much. In fact, you may think you've done it wrong. You haven't! Well, maybe you have... I can't be too sure. But what I'm saying is that it does look odd. The most important addition to this dress is a 1.5" crochet headband! I used this as the waistband. It holds the dress in place and is comfortable. You can also see that I knotted the ends of the tulle. I love the look of this and think it is totally worth it, but I will warn you that it takes a while. And you may lose a few fingerprints. As usual, feel free to email me directly at Ruffles(@)thehairbowcompany.com (remove the parenthesis) if you have any questions while you're planning or crafting your tutu dress.